With energy savings, efficiency, maintenance and back up / power redundancy, many businesses actually have the opportunity to save money with the help of a licensed electrician. Below are six ways a commercial electrician like Penny Electric can help achieve this goal. Energy efficiency not only means the maximum output and minimal waste of power, but in the Las Vegas climate this also translates to reduction of overall electrical consumption resulting in heat generation. With energy efficient wiring, components and lighting (including LED lighting), businesses not only use less power but minimize the counterproductive use of electricity needed to cool office environments. When you hire a highly trained commercial electrician like Penny Electric, you can be confident that the wiring and electrical infrastructure are installed properly, this includes among other benefits faster internet connectivity. As a result, there’s a reduction in data transfer rates, faster download times and overall higher office productivity. What’s more, your business can seamlessly handle high bandwidth capabilities such as videoconferencing and other types of advanced communication systems. When you don’t have a commercial electrician regularly inspect your wiring, it’s easy for problems to occur. 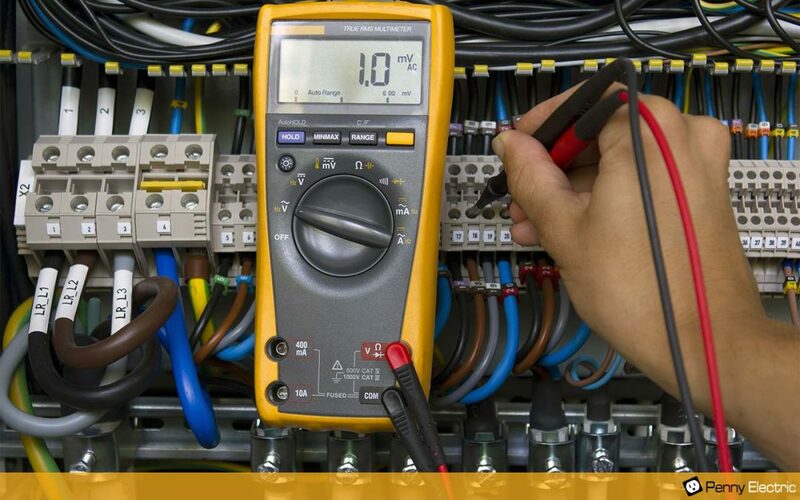 With proper electrical maintenance, electrical issues can be detected before they cause damage, down-time or injury. As a result, you can budget for items that need to be replaced immediately and plan for future electrical improvements. Having a backup power supply keeps you online during a power outage or interruption. It can also provide vital security and safty for both your employees and customers in the event that lighting were to suddenly fail. Backup power systems are scaled and designed specifically for each businesses needs and typically include generators, batteries or in some cases both. While Las Vegas doesn’t suffer from exceptionally drastic weather, security and safety in a tourism oriented town can still be especially important. At Penny Electric we can not only help advise on power redundancy but ensure that your battery or generator is installed correctly and receives regular maintenance. When you have a business, it’s essential that your employees work in an environment that provides proper lighting as poor lighting can compromise productivity and work performance. A qualified commercial electrician can ensure can not only update lighting fixtures but ensure their proper placement so that your employees are able to produce the best work possible. Because a licensed electrician knows about electrical code compliance and safety, you’re less likely to have equipment fail. Even more important, occupational hazards for your employers are minimized as are chances of fines due to any safty compliance issues. When interviewing commercial electricians, ask about their insurance coverage and be sure they’re licensed and bonded. Get all the details, regarding the type of electrical work you need done and what it will cost. You don’t want to be “surprised” later on. Ask electricians how they enter and leave job sites and if their work will affect your employees getting to work. Commercial electricians can help in minimizing wasted light. For example, they can automate lighting requirements by using photo and motion-sensors that furnish lighting when needed. Are you considering adding more cost-efficient equipment or expanding your business? If so, you’ll need a commercial electrician for installing new wiring and designing new electrical circuits. What’s more, you’ll need to consider security and emergency lighting, which requires a professional. The addition of an electrical / EV charging can promote more customers. With the addition of Farady’s Future’s 1 billion dollar EV plant relocating to Las Vegas, EV’s will become more popular. If you need a commercial electrician don’t hesitate to call Penny Electric or request a free online quote. Penny Electric is a skilled commercial electrician who understands all local compliance and environmental concerns. As a full service commercial electrician, we are available to take care of all commercial needs, including 24 hour emergency service to keep your business operating around the clock.